DVD Deal: Iron Man. 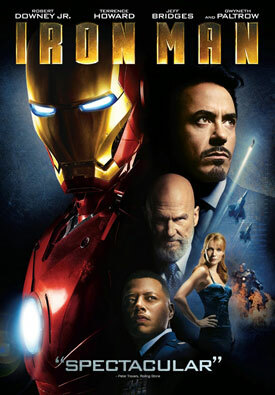 Robert Downey Jr., Jeff Bridges, Gwyneth Paltrow, Leslie Bibb and Terrence Howard star in the Marvel comic book adaptation. See DVD and Blu-ray special features, and movie trailer for Iron Man below. When wealthy industrialist Tony Stark is forced to build an armored suit after a life-threatening incident, he ultimately decides to use its technology to fight against evil. MPAA Rating: (PG-13) for some intense sequences of sci-fi action and violence, and brief suggestive content. From Marvel Studios and Paramount Pictures comes Iron Man, an action-packed take on the tale of wealthy philanthropist Tony Stark (Robert Downey Jr.), who develops an invulnerable robotic suit to fight the throes of evil. In addition to being filthy rich, billionaire industrialist Tony Stark is also a genius inventor. When Stark is kidnapped and forced to build a diabolical weapon, he instead uses his intelligence and ingenuity to construct an indestructible suit of armor and escape his captors. Once free, Stark discovers a deadly conspiracy that could destabilize the entire globe, and dons his powerful new suit on a mission to stop the villains and save the world.